Yes, you can enter to win a copy of this fantastic book by Tracey Stewart! Just see the Rafflecopter directions at the end of this post. 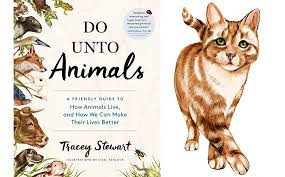 We're thrilled to tell you a bit about Do Unto Animals: A Friendly Guide To How Animals Live, and How We Can Make Their Lives Better, by Tracey Stewart and give you the opportunity to win a copy. And if you need a last minute present for an animal loving friend or sweetheart, we guarantee this wonderful book will make the perfect Valentine's Day gift! True to its title, it is a friendly and fun read—no preaching or figurative finger-wagging from Ms. Stewart. Do Unto Animals is all about education, presented in the friendliest and kindest tone, and enhanced with mesmerizing, luxurious illustrations by Lisel Ashlock. Once you dive in, you'll see we all have a lot to learn about how our furry and feathered companions live, what makes them comfortable and happy, and the simple steps we can take now, to improve their lives. A New York Times article described Ms. Stewart as "The Horse, Dog, Goat, Sheep and Cat Whisperer", and the book as a "charming...memoir and how-to about enriching the world of the creatures in your life, whether they be dogs, cats or the crows in your backyard." And we heartily agree. For those of us who can only dream of living on an expansive property with an array of animals, this book will prepare us for caring well for any creature we might encounter or rescue, just in case our dreams come true. With chapters like "How to Make A Turkey Happy" (hint: it does not involved being roasted and basted for the Thanksgiving table), "Adopt, Don't Shop" that makes an eloquent case for adoption, and "Living in Harmony with Our Burrowing Buddies, we learn how to live in harmony with the fascinating array of creatures who share our world. The book also includes "Stewart Family Traditions" that describe how you might involve your entire clan in caring for animals (Ms. Stewart is the spouse of Jon Stewart of The Daily Show, and their New Jersey farm property is slated to become an animal sanctuary and educational center). The chapters also include numerous DIY projects (think bee house, frog sanctuary or simple cat toys), and even recipes your four-legged friends will enjoy—horse cookies, anyone? As Ms. Stewart said when discussing the plight of carriage horses: "It is possible to find joy in and inspiration from animals without their having to suffer for it." And that sums up what this book shows us with gentleness and humor: we can make simple changes in our lives that demonstrate compassion and caring for our fellow living creatures—and role model these behaviors for our children. Now, on to the giveaway! 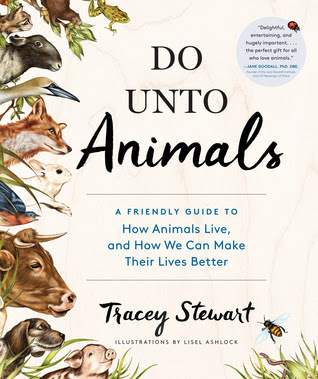 One lucky reader will win a copy of Tracey Stewart's Do Unto Animals: A Friendly Guide To How Animals Live, and How We Can make Their Lives Better. Just follow the simple Rafflecopter directions below. Entrants must live in the U.S. or Canada. Would like to with this and then pass it on to the SPCA for their auctions! I would love to win this it sounds like an awesome book! I would like to win because it seems like a very interesting read. I would love to know how to get make my animals lives better. would love to win this book, it sounds great! and well designed book for our grandson. I would like to win this giveaway. Thanks! i would love this book. i have followed the stewarts for a long time. i know she was a vet and they are both very much pet lovers and have developed a large farm to save animals. sounds like a wonderful book to read. thank you. I would like to win! But my email address that I check is at yahoo.com, not gmail (the beginning is the same, though).